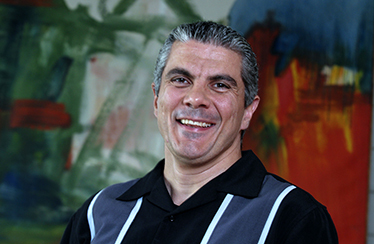 The primary focus of Tizzano’s work involves the third chemical sense, known as chemesthesis. Tizzano likes to describe chemesthesis as the scientific term for chemical sensitivity; either way, you’re more familiar it with than you might think. Chemical sensitivity allows you to feel the “burn” of capsaicin in chili peppers, the “coolness” of menthol in peppermint, and much more. But the chemical sensitivity system isn’t all tingles: new research is revealing that chemesthesis is an important protective sense that helps your body detect potentially dangerous pathogenic invaders and then trigger inflammatory and immune responses. Tizzano, who received his PhD from the University of Verona in Italy, joined Monell in September after several years at the University of Colorado as an Assistant Research Professor in the Department of Cell and Developmental Biology. He has spent much of his career studying a specific cell type involved in the chemesthesis system. These specialized cells, which have several molecular components in common with taste cells, are known as solitary chemosensory cells (SCCs for short). They line the membranes of the respiratory, urinary and digestive systems, where they serve as chemical sensors for the chemesthesis system. The trigeminal nerve, the primary nerve that transmits sensory information from the face, mouth, and nasal passages, mediates most chemesthetic sensations. In the nose, chemicals can activate the trigeminal nerve in several different ways. Some molecules, such as capsaicin and menthol, are able to ‘squeeze’ between junctions of cells lining the nasal mucosa to directly stimulate the underlying trigeminal nerve. However, because of their size or physical properties, other molecules are unable to penetrate membrane cell junctions; these molecules are detected by receptors located on thin fingerlike structures called microvilli that extend from SCC cells scattered in the mucous membranes into the nasal cavity. The activated SCCs then relay a signal informing the underlying trigeminal nerve that the chemical has been detected. 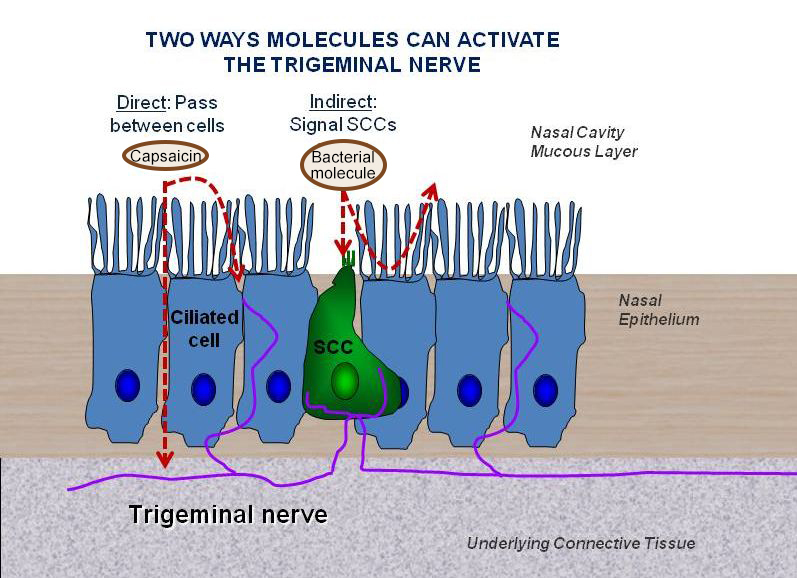 In this way, SCCs act as your body’s sentinels, extending the trigeminal system’s ability to sense and respond to chemical signals from irritants and pathogens. Tizzano’s research concentrates on the mechanisms and functions of SCC-activated pathways in the respiratory system. He has shown that SCC activation by inhaled irritants and bacterial metabolites can trigger the body’s immune system leading to airway inflammation. In other studies, he found that SCC activation into the nose can mediate long-range reflex responses to protect the respiratory system, such as slowing respiration or holding breath (to avoid inhaling additional pathogens) or behavioral avoidance of an environment that contains an irritant. Tizzano’s broad scientific perspective allows him to fully appreciate the diverse range of research that takes place at Monell every day. He also respects the Center’s forward-looking vision toward improving health and wellness. “While Monell focuses on basic science research into taste, smell, and chemesthesis, the work here also is geared toward meaningful applications,” he says. With a growing understanding of the link between SCCs and airway inflammation, Tizzano has begun exploring the possibility that SCC activation could also be involved in headaches related to strong odorants and inhaled irritants. This hypothesis suggests that SCCs — in addition to having components of the taste system – could also contain olfactory receptors. Tizzano is still in the early stages of this work. 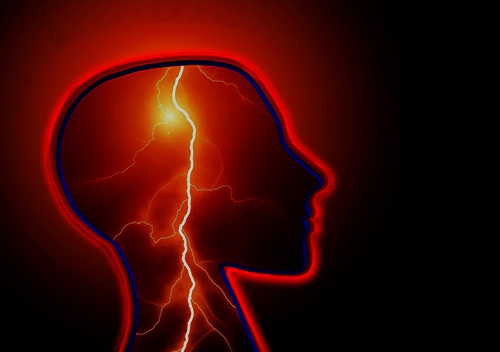 However, his preliminary studies suggest a connection between odor-mediated SCC activation and specific types of inflammatory responses that are consistent with migraines. Continued research will involve determining conclusively if an odor can trigger a response in SCCs. If so, the next step will be to ask if SCC activation by odorants (and other compounds) can lead to migraine-like inflammation. It hasn’t taken Tizzano long to realize that Monell’s close-knit faculty will be a powerful asset in his work. For example, both Robert Margolskee and Ichiro Matusmoto are working with SCC cells located in the gut (where they’re known as tuft cells) to define their role in protection against intestinal parasites, and Tizzano looks forward to leveraging their expertise and combining forces. “I think one of the keys to Monell’s success is its extraordinary faculty, which combines an incredible knowledge about the chemical senses with a keen interest in collaboration,” he says. And he’s keeping an eye on the ultimate goal of his research – to improve human health.